Each term a group of about 50 women of all ages get together to do craft, chat and enjoy morning tea together. The group is casual and friendly. It is run by ladies from the church and caters for anyone in the local community. Come and learn something new, or be inspired to finish that unfinished craft item you have put away in the cupboard! Patchwork and quilting are always being taught. Occasionally there are other special project classes but the majority of women bring along their own projects to work on, such as scrapbooking, embroidery, card making, crocheting, knitting and jewellery making. The ladies always share amazing ideas and tips to inspire one another! Please click here to Print your 2019 Craft Dates! A great crèche, staffed by wonderful women, look after the babies and preschoolers, giving young mums the chance to enjoy some time and space to be creative, knowing their little ones are happy and close by. HOW CAN I ENROL OR FIND OUT MORE? You can register online here, or by email here. Click here to email any questions you may have to the co-ordinator, Diana. 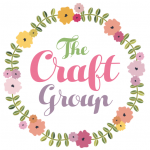 WHAT ELSE HAPPENS AT “THE CRAFT GROUP”? Each morning we provide a tasty morning tea, during which a short “Thought from the Bible” is shared. Throughout the year, crafters can enjoy other events such as “Mega Mornings”, lunch outings and ALL DAY craft days.